These are not just for looks. 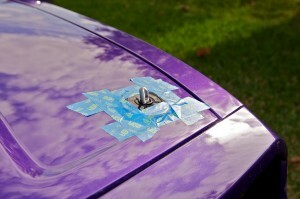 Because my hood is an after market hood made of fiberglass, I need to ensure that it will not break loose from the hood latch at any speed. 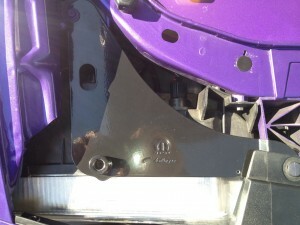 The installation begins with mounting the base plate to the fender and radiator support as shown below. 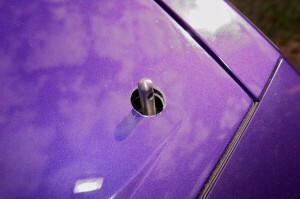 The nice thing about the MOPAR hood pin kit is that the base plate installed without having to drill any hole or guess where the pin needs to be placed. If all goes well, and it should. 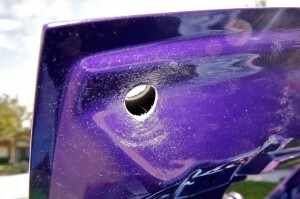 Your pin should be center of the hole. My biggest worry was the striker plate. This adheres to the hood with extra strong 3M tape. 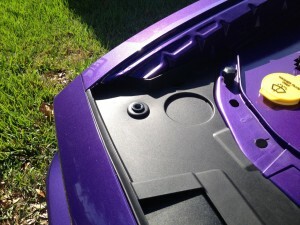 If you’re off, when you close the hood your pin will hit the plate and be ripped from the hood, paint included. This is why I test fitted it with some painters tape, making sure the pin is centered to the plate and closes without interference.